The sonifications are currently computed offline: after a click in a scatterplot of the data the nearest neuron of the GNG is searched and the graph is excited at this location. Since energy propagates along topological connections between the GNG graph, the sound is completely determined from a connected subgraph, e.g. a cluster. The sonifications last about 2 secs, and are presented to the listener as soon as they are computed. Since this interrupts the exploratory flow only slightly, the user is appearing an (discrete) interactive mode of exploration. 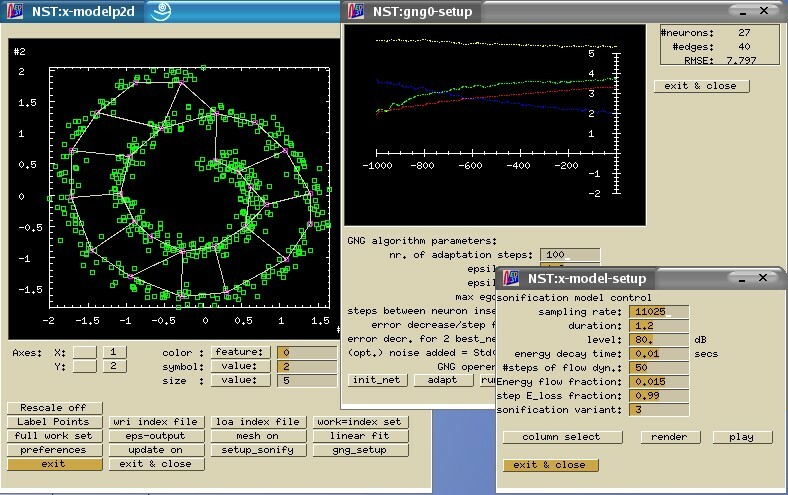 A noisy spiral dataset is adapted by a GNG. This are GNGS probing sonifications from (a) the outer end of the spiral, (b) in the middle, (c) the inner end of the spiral. The examples are for differing network complexity, expressed by the number of neurons N.
The following for sonification present the dynamically changing auditory state of a GNG during the adaptive growth process. The MNIST dataset contains 24x24 pixel bitmaps of handwritten digits. 8x8 subsampling was performed to obtain 64-dimensional records, about 1000 records for each class. The examples are computed for the classes of '1' and '2'. The shape of '2' contains more internal degrees of freedom, resulting in a higher intrinsic dimensionality of the distribution, audible from the higher brilliance and complexity of the probing sonification.